I was, and still am, tremendously disappointed that we were unable to get to Bangkok. I was really looking forward to seeing it, as it is one place I have always wanted to visit. Primarily, because my father had been there during an R&R in the 60s. I had made a list of all the things I hoped to see in the two days that we had planned to be there. Unfortunately, the recent political uprisings had forced the line to abandon the thought of docking there, and I completely understand that. It’s still very disappointing. 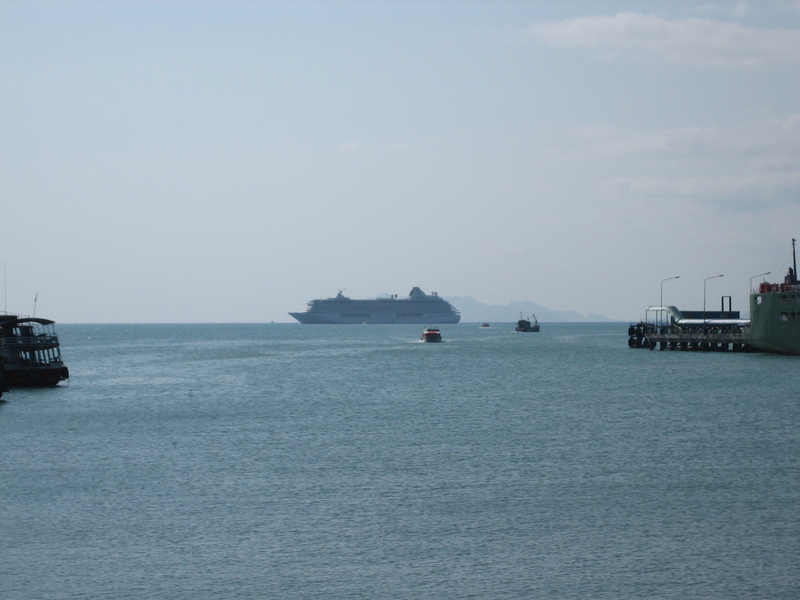 In a bit of a quick manoeuvre, the line rearranged things so that we had a full extra day in Ho Chi Minh City, and then a day early into Sihanoukville, before sailing across the Gulf of Thailand to the island of Ko Samui (Coh-Sah-moo-ee). I did some quick research on it before arriving, and though it is very nice, it is virtually identical to Oahu, Hawaii. I’m not joking about its similarity to Oahu, it is almost completely identical to the North Shore in every way. Like Oahu, Ko Samui, is a moderate mountainous island, which makes transport through the heart very difficult, if not impossible. Hence, there is a large ring road that goes completely around the island. Almost all the development is around the coast, following the road. You will drive for miles, past small shops, and tall walls that shelter houses along the coast. The architecture, too, could be Oahu. You will see pricey homes peaking above a wall that abuts the road. Where one walled home ends, another picks up. Occasionally, you will see a vacant lot, and get a view of the sea. Of course, in the centre of the lot is a large “For Sale” sign. Even the shops that you will see along the road are the same as Oahu: 7-Eleven, Circle K, KFC, and then some local beach shops, convenience stores, and art shops. I could not get over how much like Hawaii this was. Oh, and like the North shore, shrimp is a major product here. While I love Hawaii, and the North Shore of Oahu, I was pretty disappointed by this. The island felt too familiar, there was no adventure from what I was seeing. Luckily, I had noticed that there were a few sights that I thought would be unusual, and showed them to Francis. 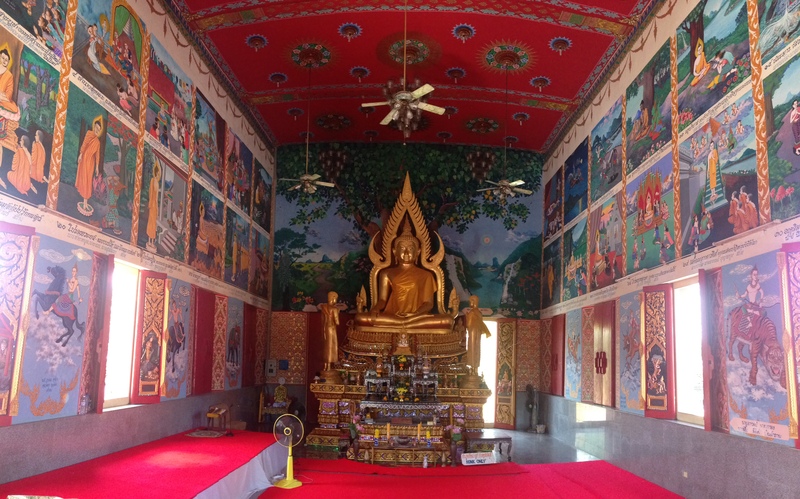 We made plans to visit the “Big Buddha” at the Phra Yai Temple, and the large Wat Plai Laem which was home to an amazing statue of Guanyin, the 18 armed goddess of Mercy and Compassion. The Island does not have the capacity to dock a ship the size of the Serenity, so we would have to drop anchor and tender into the port. You may recall from my previous adventure in Ha Long that tendering is the process of using the ships lifeboats as shuttle boats to get us ashore. None of us were prepared for just how far out from the island the ship needed to be. It was a rather rough and long 15 minute tender ride to the pier. Once there, getting on shore was a bit of a challenge as the tender was rocking quite a bit, which meant that the gangway was moving in and out from the pier. We made it on to land and immediately pushed our way through the dense crowd of drivers holding their signs and made our way into the port town of Nathon. A little fact about our arrival here, because the population of the island is only 63,000, our arrival raised the population by 2.5%. Nathon, is a typical little port town. Everything here is in English and Thai. There are many British influences, including the presence of TESCO. Inside of the local TESCO was something very American and very near to Francis’ heart; yes, we found a Dunkin’ Donuts. I converted some currency to Baht, and took a little out of the ATM. This would be my last stop before the megalopolis of Singapore, and the last chance to buy some crafty souvenirs. Baht in hand, we headed back to the pier. Francis and Kennedy were a bit surprised that I was walking right back into the Lion’s den, but I told them, most of those coming ashore were already here and had made their way off. Now was the time to make a deal, because it would be less hectic, and the remaining drivers would give us a slightly better deal. Sure enough, in just a few moments, we had worked a deal for two hours to take all three of us to both Phra Yai Temple and Wat Plai Laem for THB3,000 (approx. US$100). Prices were going up here because of all the European tourists that had discovered the island. It was no longer the cheap resort haven that it used to be. In fact, resort names here read like the many exclusive enclaves: Four Seasons, Ritz Carlton, etc. 30 minutes from Nathon, we arrived at the very cute village at the base of Phra Yai Temple. 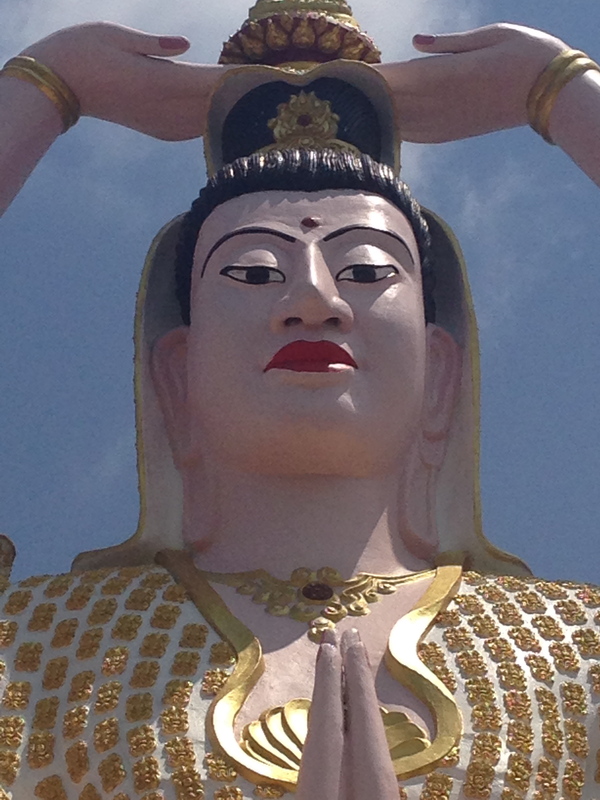 As we drove it, the head of the Big Buddha looked out over the rooftops at us. We were all fairly amazed at the size. From the village, we passed through the gates of the Temple, which were protected by to large traditional Temple guardian statues. They were brightly decorated with the large boars like teeth snarling up out of their mouths. We entered the Temple grounds to see the Gold Buddha sitting peacefully on the hill at the top of the large stone staircase. The stairs were sounded by cute buildings with terra cotta booths. Here, the monks sold tiles, and other items for use in the continuing restoration projects. You could buy a tile, sign your name to is, and it would be used in the new roofs of the Temple buildings. The architecture is stunning, and the use of colour is overwhelming. It’s like you have stepped inside a giant Crayola crayon box with every metallic colour they ever developed. 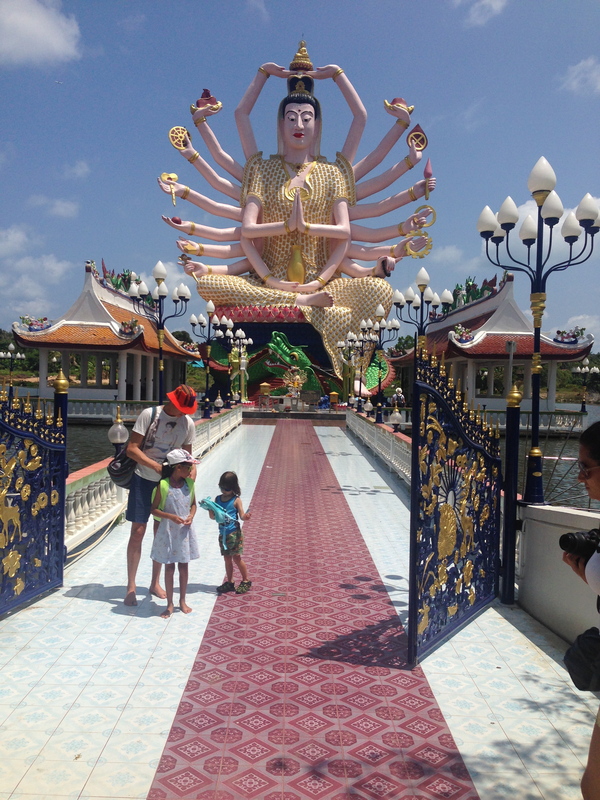 The Staircase to Buddha was guarded by the traditional seven headed serpent with his body acting as the banister. The head of the Naga leading to Big Buddha. 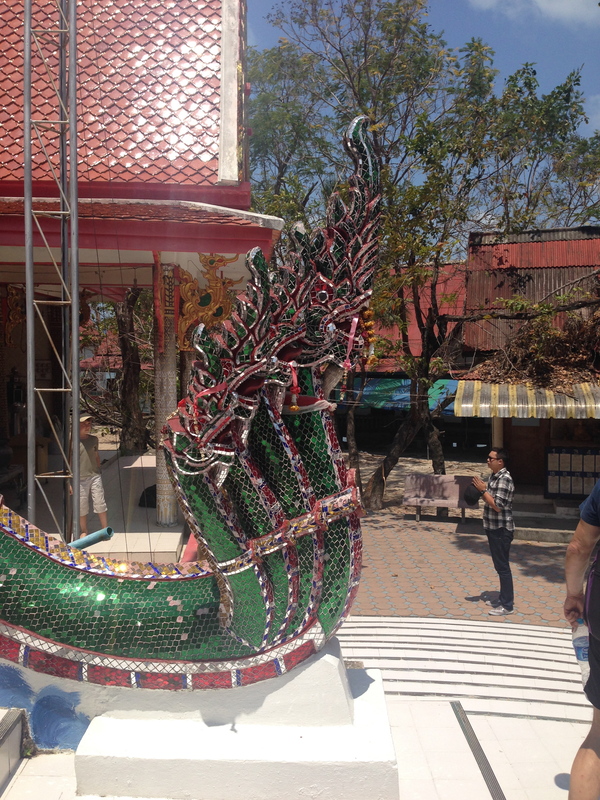 The seven ornate heads appeared to be decorated in small shiny emerald green tile scales. Red, pink, magenta and silver tiles were used to create the features of the heads. The body was brilliant metallic emerald with a large gold spine. You almost didn’t want to touch it for how magnificent it was. We took off our shoes and made our way up the stairs. head in his hand. 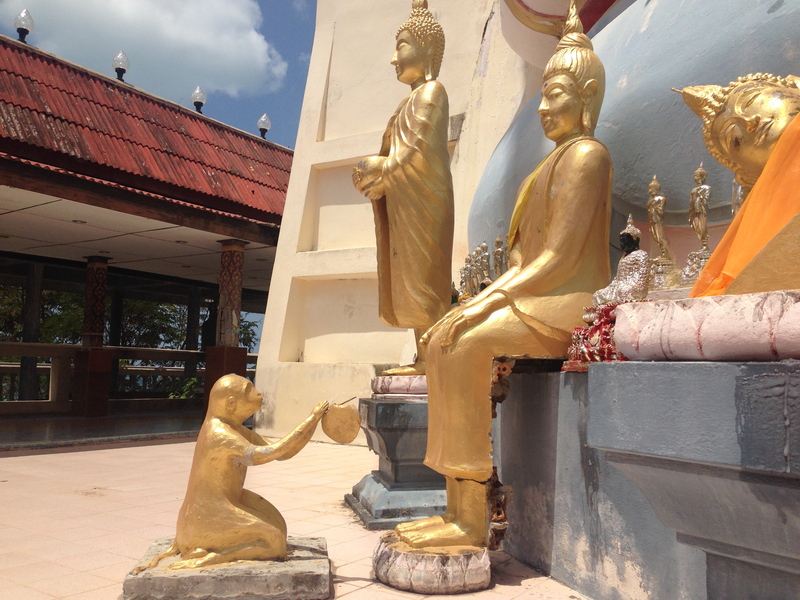 A small golden monkey made an offering to another Buddha. Rows of small Buddha Statues were lined up; they appeared to have been presented by visitors. Soon, it was time for us to make our way to Wat Plai Laem. We made our way back to our cab, and headed the short distance to the next Temple. 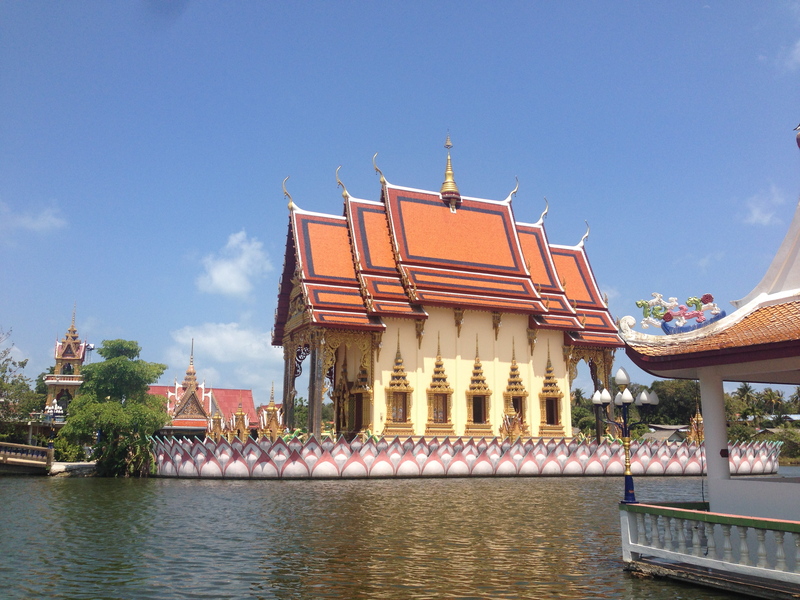 Arriving at Wat Plai Laem was amazing. I have really enjoyed the architecture of Buddhist temples and I look forward to getting home and reading much more about this fascinating religion and its many symbols. I have also found great peace at these places. It is a very different peace than I have ever seen in a church. Buddhism does not seem to be so much about “fearing God” as much as it is about finding contentment and peace in life. It is very interesting to me. The Shrine on its Floating Lotus Island. Buddha and Guanyin, which flank the floating central Shrine. 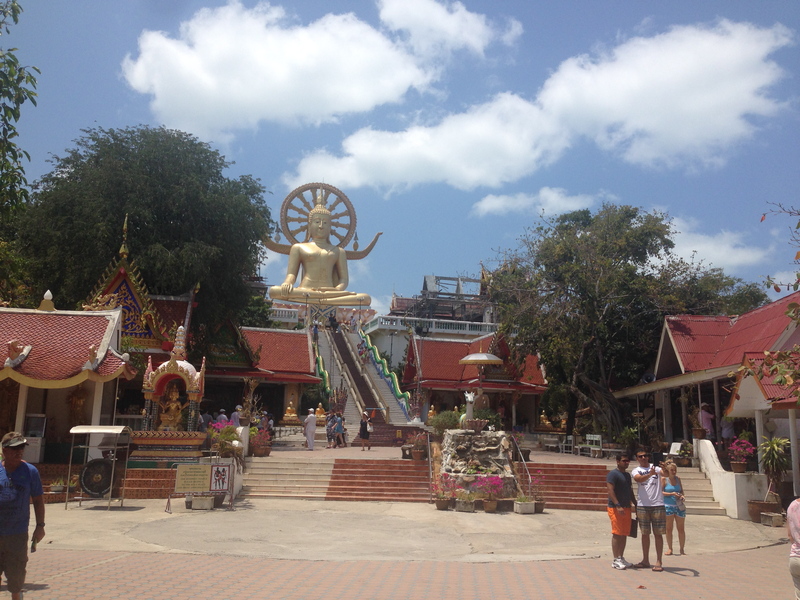 We began the exploration with the centre Shrine, which is the most sacred of places in a Wat. As we crossed the bridge to the massive “floating lotus blossom” like island, we had great views of the whole complex. The butter yellow temple was decorated in the usual bright reds, greens, and golds that we had become used to seeing. The windows and doors were wide open and I got a peek of the brilliant red, heavily decorated interior. I returned to the front, slipped off my shoes and made my way up the steps into the temple. Inside of the Shrine at Wat Plai Laem. carpets lined the floor and matched the red ornate ceiling. The wood shutters on the windows were wide open and allowed for a wonderful cooling breeze to pass through. Facing out the opposite doors to the one I entered, was a large gold Buddha on an altar, with two monk like statues flanking him. I can’t explain the calm and peace that these places bring me. I’m not Buddhist, I know virtually nothing about Buddhism, and I am not a religious person. I believe in this life, and this life only, yet these places really make me feel relaxed. I just want to sit down on the floor and rest quietly in peace. I guess that part of what it is stems from when I was very sick. I learned that if laid very quietly in bed, closed my eyes, and focused on each part of my body, beginning with my feet and working my way to my head, I could do a real self exam about each part of body. Doing this, I was able to give excellent information to my doctors, and we were able to catch many things before they became big problems. In a way, that was a form of meditation for self analysis. I can still do this, and when I do, I can tell you what my blood pressure is to almost precise numbers. I have amazed a few of my docs over the years with that ability, and several have tested me on it. I probably need to get back to understanding and respect for self. Guanyin at Wat Plai Laem. this Wat. I put my shoes back on and walked off of the central island to Guanyin’s Island. Unlike other Temples where Buddha is the primary figure, here it is very clearly Guanyin. The story of Guanyin is obviously very new to me, but she is in many ways, the Buddhist version of Mary. In fact, she is frequently interpreted holding an infant. Her position as the Buddhist symbol for Mercy and Compassion is also similar to that of Mary in Christianity. Also like Mary, she is often seen in locations where women are trying to conceive but having difficulty. While she is frequently presented as a woman, she actually has many forms, and can sometimes appear as a male, or a child. And, though we were seeing an eighteen armed Guanyin, this is just one of her many forms. Most images of her are two armed. The many armed Guanyin stems from a story of her trying to reach out to all those in need of mercy and compassion and not being able to reach them. Therefore, another god gave her more arms. Guanyin looking down upon us. I took off my shoes and walked through her blue wrought iron gates, and across her bridge, to stand at her enormous feet. A dragon sat poised to protect her underneath of her lotus surrounded pillow. Her one foot sat on the dragons back, as if to keep him under control and not to eager to lash out at an approaching visitor. An offering table stood in front with simple gifts to keep her refreshed. Her many arms raised various objects up, and created a large fan behind her. No matter where we stood, her eyes glared down on us with the gaze of a disapproving mother. She was fascinating, but time was short. I made my way back across the bridge and put my shoes back on. I wandered around the grounds a bit, looking at the other buildings, and then made my way to the bridge that led to the Laughing Buddha. While this was not the most attractive Buddha I had seen, the figures on his bridge were really interesting. Lining the bridge to his island were these chicken like statues on poles. They looked like a dragonified chicken with a tiny elephant’s trunk. I couldn’t make this up. Imagine a rooster, with a big typical tail, the head of a Chinese style dragon, and a tiny elephant’s trunk in an upward S formation flanked by two little tusks. They were very interesting. I wouldn’t mind having one of those. Well, we had to head back to town. We wanted to grab lunch, and Francis had two shows this evening, so he had to get back to the ship and set up. We jumped back in our cab and made the 30 minutes trek back to Nathon. Upon our return, we paid our driver and gave a nice tip, then set out to explore a bit before choosing a restaurant. 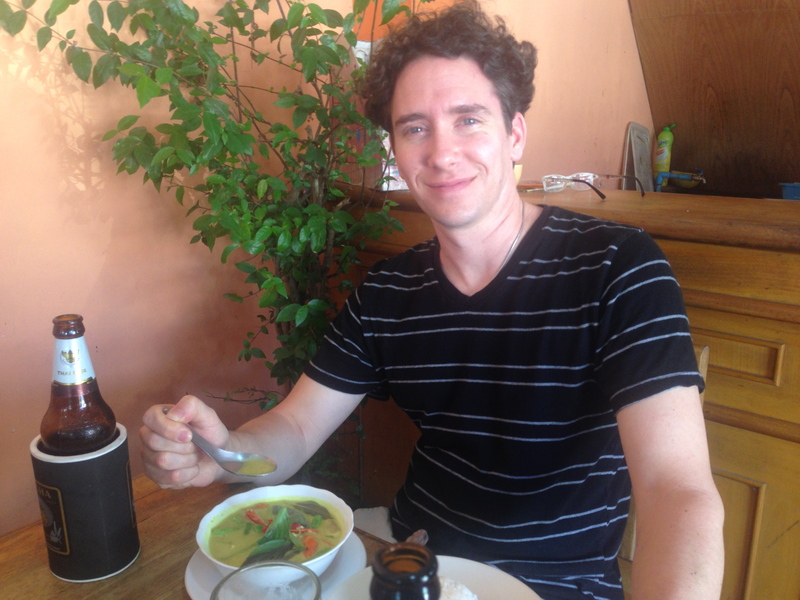 Francis enjoying his Green Curry. Chicken with a side of chips and a Coke for Kennedy. Green Curry, extra spicy, with a side of rice for Francis. I ordered a Thai Fried Noodles with chicken and a side of fried spring rolls. Keeping with our beer tradition, Francis ordered a Singha, and I ordered a Chang. The extra large bottles were just under US$3.00 each. The food was very good, and I am now looking forward to spending more time back home trying out local Thai options. A friend of Francis, and drummer on the ship, Adam, stumbled upon us and sat down. 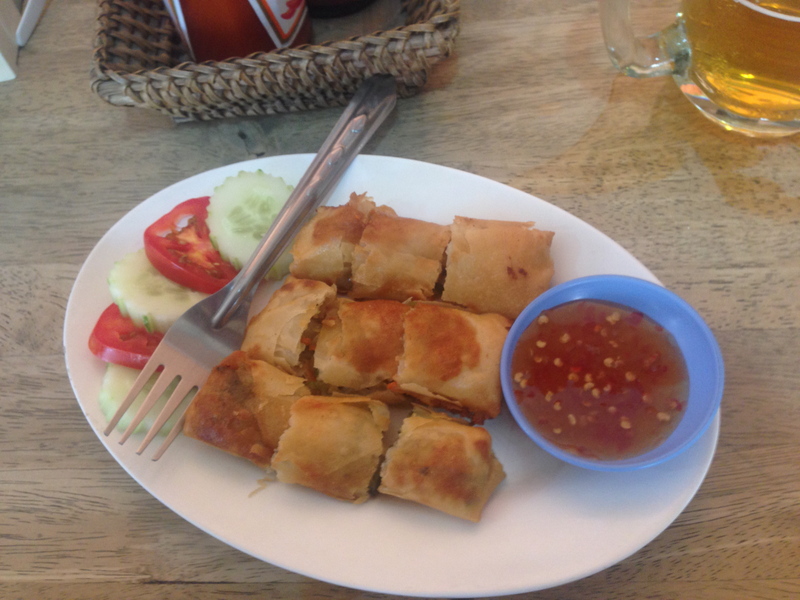 We logged onto the free wifi and posted some pics of us enjoying our real Thai meal. Following lunch, Francis and Kennedy made their way back to the ship, and I stayed in town a bit longer. I wanted to pick a few more souvenir items for people back home and this was probably going to be my last chance to do it. After picking up a few nice items, I walked over to the pier and waited for the tender. Now, some of the guests on Crystal are a real pill. Most are very nice, and I have enjoyed meeting the, others are just over the top weird. This one woman waiting on the pier was one of these people. She had stood up to walk down the steps to the tender and had to be stopped by the security guard as they were not yet ready. A friend of hers was behind her and placed his hands on her shoulders. “DON’T PUSH ME!” she lashed out. She became very indignant. Then, when we could board, she kept yelling, “I’m going to fall, I’m going to fall.” Then, with the tender rocking quite an it, “I can’t, I’m going to fall, I’m going to fall.” The Crystal crew should be awarded for their patience in dealing with people like this. I could hear her on the rocky 15 minute ride to the ship, complaining about how they should make it more smooth, as if they should have some miracle anti-wave machine. Arriving at the ship, she was yelling about falling again. She deserved a daytime Emmy. It’s hard to believe that this incredible adventure is almost at an end. I’m typing this day after it happened, and we are on a sea day as we make our way to Singapore. We will only have a brief time to explore that amazing city, as we have to be ready to depart the ship at 2:45am on the 10th. The trip has changed me in so many ways, and I cannot wait to share all of my pictures with everyone. I’m already looking through the Crystal catalog and trying to decide where I want to go next. If anyone is interested in exploring the world on a luxury ship with me, let me know. It is much more affordable to share a cabin than to go single. And for everything that Crystal includes, it is really not that expensive. I’m leaning heavily towards a Panama Canal crossing. That could be fun. Tomorrow we arrive at our final destination, Singapore, the Lion City. I can’t wait. Looking forward to seeing all the photos.